The United Nations has ruled the Saudi teenager who fled her home country over fears she’d be killed for renouncing Islam is a refugee. 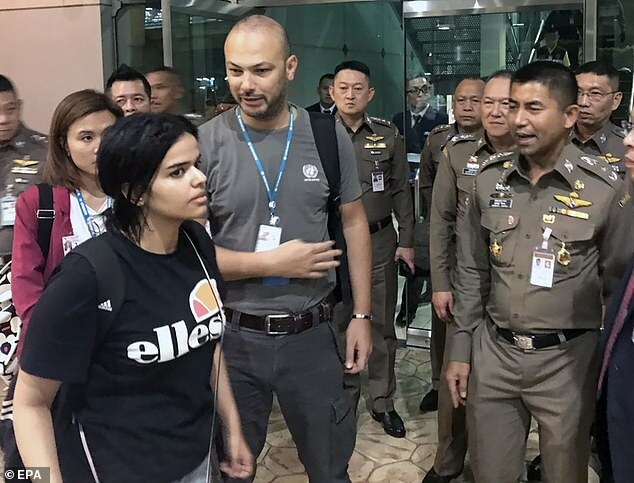 Rahaf Mohammed Alqunun had planned to enter Australia on a tourist visa and seek asylum before she was detained by Thai authorities on Sunday. On Wednesday, the Australian Department of Home Affairs revealed that it will consider the 18-year-old’s referral from the UN. In a statement from the government, Ms Alqunun will be subject to Australian checks before she is granted a humanitarian visa, including character and security assessments. She is currently in the care of UN officials after claiming her family would kill her if she were sent home to Saudi Arabia, where she has renounced Islam and ‘rebelled’ against her father. Health Minister Greg Hunt says the Australian government has been urging the UN High Commissioner for Refugees to process her case quickly. ‘We’ve been successful in getting them to agree to do that,’ Mr Hunt told ABC TV on Wednesday. Mr Hunt said the government would give ‘very, very serious consideration to a humanitarian visa’ for the teenager if she was found to be a refugee. Ms Alqunun’s father and brother arrived in Bangkok on Tuesday evening and have asked to see her. But Thai immigration chief Surachate Hakpan said the men would have to wait to learn whether the UN’s refugee agency would allow the request. ‘The father and brother want to go and talk to Rahaf but the UN will need to approve such talk,’ General Surachate told reporters. The news comes after fears Ms Alqunun’s Australia tourist visa had been cancelled, with friends taking to Twitter to share the information. But a government source told The Australian the visa had not been revoked. Instead, they confirmed she would have been refused entry to Australia as the visa was not reflective of her intended stay in the country. Ms Alqunun ran away from a family trip to Kuwait last week and flew to Thailand in the hope of reaching Australia to seek asylum.